Deep down, most of us knew that the end of the world would be set to Led Zeppelin’s “Immigrant Song.” Whether it be the four horsemen of the Apocalypse, valkyries, or a towering flame demon, something about those driving power chords means we’ll be rocking as we go. So if Thor follows suit with most of Hollywood and Thor: Ragnarok is the end of a loose trilogy, it’s a fitting note to end on, except of course the God of Thunder will go on in other Marvel movies. That’s the strength and the weakness of Thor: Ragnarok: it’s a fun chapter in a seemingly endless epic, but still just another chapter. It feels a lot like what Marvel Comics were in the 1960s. Readers could pick up an issue of Journey Into Mystery (eventually The Mighty Thor) and see Thor pass by Doctor Strange on the street. The meeting wouldn’t really have much to do with the story; it was just fun. Here it means that the post-credits scene in Doctor Strange pops up again, expanded into a comic sequence of gods in New York. Thor (Chris Hemsworth) and Loki (Tom Hiddleston) could find the self-exiled Odin (Anthony Hopkins) on their own, but it wouldn’t be as fun for fans if Benedict Cumberbatch didn’t show up to do his mystical House act. Director Taika Waititi provides a lot of fan service as well as slapstick, which gives Thor Ragnarok an uneven tone. Hilariously recapping the end of Thor: The Dark World hardly prepares viewers for the very dark undertones of what’s happening: Hela, God of Death (Cate Blanchett) has escaped her prison, and the prophecy of Ragnarok is about to be fulfilled. At least it gives Anthony Hopkins something different to do besides his usual all-knowing keeper of secrets. You can probably fill in the blanks on your own, and maybe that was the intention. But there’s a diffidence to the way characters are treated here that’s hard to ignore. 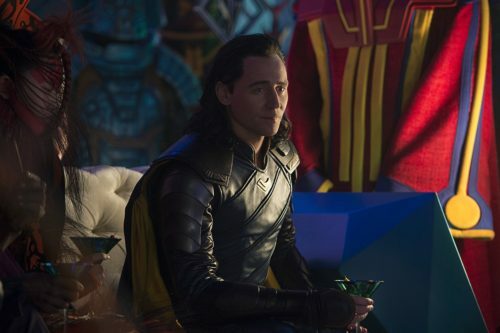 It’s a fun party, but until the third act, Thor: Ragnarok doesn’t really dive deep. By then, it’s hard to find it earned; instead, it comes off as perfunctory, as perfunctory as the quick dispatch of characters that were important to the previous two Thor entries, including one for whom the production just acts as if there’s a blindspot. Who cares when you’re having so much fun? It’s big, it’s loud, it’s colorful. 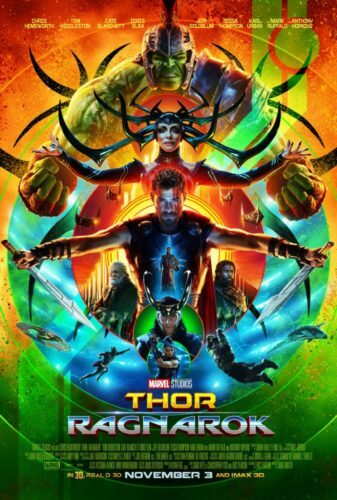 And in keeping with Marvel tradition, Thor: Ragnarok fits within a specific genre of film — this is their ’80s low-budget science fiction film, despite it being of very high budget. (The score, by Mark Mothersbaugh, feels like one by John Carpenter.) By this time, we’re also all very charmed by these actors. Thompson has already been confirmed as part of the follow-ups, and if this means that we might get an A-Force movie — which they’re hinting — I’m all for it. Charm is what it has going for it. By now, we know how versatile Hemsworth is as an actor, and the movie pushes that to the limit. As a character, Thor is only as intelligent and competent as any particular scene needs him to be for the scene itself to work, not as an arc through the film. The same goes for Karl Urban as Skurge, in the comics a somewhat tragic villain and on film just… whatever they need. As for Mark Ruffalo, there are hints of a dark fear in Bruce Banner this time around, but the script or the editing just doesn’t give that room to breathe, because it’s not funny enough. Not wasted but still not given room for nuance, Blanchett makes a picture perfect Hela. She clearly enjoys the role, and we can hope it’s not the last of her in the Marvel Cycle. It’s clear that we’re supposed to feel that maybe she was wronged millennia ago, but the way Blanchett inhabits it, she’s just an out and out villain, no doubt about it and maybe that’s kind of nice to embrace. That’s another strong point about Thor: Ragnarok. It’s a step forward in two directions of mythology — fully bringing to life the worlds envisioned by artist Jack Kirby, and going ahead and implying that the Asgardians aren’t aliens (as the first Thor claimed); they’re gods after all. Waititi does redefine Thor as a character in the sense that at least his powers aren’t just “Superman with a hammer.” And Loki is the God of Mischief, not just tragic antagonist. After Thor Ragnarok, they are characters redefined (though Loki has long been redefined by Hiddleston’s charisma). Dang. These things are like potato chips. 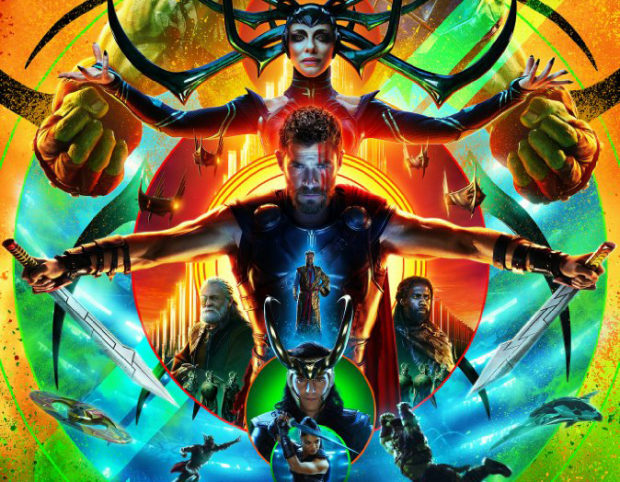 And like a bag of potato chips, Thor: Ragnarok is delicious, but ultimately not filling. Some content may have settled during editing, but we keep coming back anyway.